Visit our general family dentistry and get ready to experience a different type of dental care. A visit to the dentist's office isn't just about checking for cavities anymore – there have been incredible advancements in the field of dentistry, and we have responded by expanding our range of custom dental care services to suit your needs. We are always at the forefront of the latest in dental technology and research in dentistry and use the most up-to-date methods and technology to help our patients' achieve their desired smiles. At David Kurtzman, D.D.S., we frequently perform a wide variety of general dental procedures, so you can rest assured that yours will be performed by a skilled and experienced medical professional. With an arsenal of state-of-the-art equipment and an expert multidisciplinary staff dedicated to your dental health, we are in a unique position to offer best-in-class dental care. Our commitment to a clean, germ free environment means better, safer dental care for our patients. Dr. Kurtzman is meticulous when it comes to keeping our dental equipment clean. We bag any equipment that can be bagged and we leave disinfectant on any surfaces being cleaned for at least 10 minutes to ensure that the disinfectant has a chance to work. We are committed to providing our patients with a safe, germ free environment. In addition to all the services you would expect from a dental office, Dr. Kurtzman has built a great reputation for working with patients who have special dental care needs or who may have some type of medical problem that has made dental care a challenge. Dr. Kurtzman is well known in Georgia for his expertise in sleep and sedation dentistry. Contact us today to schedule your next dental procedure. Our commitment is to providing the highest quality of dental care for our patients, and we want to do the same for you. 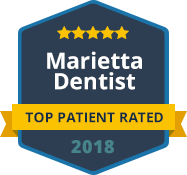 For more information or to schedule an appointment, please call or contact our Marietta Dentist office today.